As a maker of superior performance tyres, BFGoodrich is proud to say that we’ve been passionately performance-driven since the start. From the deserts of Baja to the 24 Hours of Le Mans, our rich heritage of successful performance racing helps ensure that your vehicle is ready for any challenge, at any time. In 1870, Dr. Benjamin Franklin Goodrich founded the first tyre factory in North America, in Akron, Ohio. Even then, performance was already an integral part of the brand’s DNA. This led Charles Cross Goodrich, son of Benjamin, to establish the very first tyre research centre in the United States. As a result, BFGoodrich began to stand out from the competition as early as 1903, when it provided the tyres for the Winton Touring Car, the first car to cross the North American continent from east to west. BFGoodrich soon identified another means of improving mobility by entering the rapidly expanding industry of aeronautics. This allowed the challenge-oriented brand to push the limits in new ways. The brand was involved in the 75km/h speed record set in 1909, at the first international air race held in Reims, on a Curtiss Aeroplane Corporation plane. The 1920s presented the chance to conquer a challenge that was once thought unthinkable. In 1927, BFGoodrich provided the tyres for the Spirit of St. Louis, in which Charles Lindbergh made the first nonstop transatlantic flight in history. WE'VE NEVER BACKED DOWN FROM A CHALLENGE. And we never will. Below is a glimpse of some of the notable challenges that BFGoodrich has conquered throughout its rich history. 1903: The first vehicle to cross the United States was fitted with BFGoodrich® tyres. 1914 and 1915: BFGoodrich becomes the first tyre manufacturer to win the Indianapolis 500 two years in a row. 1927: Aviator Charles Lindbergh makes the first non-stop transatlantic flight equipped with BFGoodrich® tyres. 1977: The BFGoodrich® Radial All-Terrain T/A® tyre sweeps both SCORE Baja 500 and Baja 1000. 1981: Columbia space shuttle is fitted with BFGoodrich® tires. 1984: BFGoodrich® tyres and Mazda cruise to a Championship C2 class victory at 24 Hours of Le Mans. 2002 - 2007: BFGoodrich wins the Dakar Rally for the sixth consecutive year. 2006 - 2011: BFGoodrich drives to five consecutive World Rally Cross championships. 2017: BFGoodrich triumphs in their return to the Dakar Rally. and vehicles just like yours. It’s more than just crossing the finish line first that excites us. BFGoodrich is driven to produce industry-first technology in all of its tyre segments. 1965: First radial tyre on the American market: the Lifesaver. 1972: Launches radial-ply touring tires in North America, while other manufacturers continue to develop “Bias-ply” tyres. 1976: The world’s first all-terrain tyre. 1996: Introduces first line of heavy truck/commercial tires. 1999: The first tyre with coloured read is introduced: The Scorcher T/A. 2002: The world’s first 24-inch 4X4 is released. 2016: Commemorates 40 years of SCORE BAJA Racing and the 40th anniversary of the Radial All-Terrain tire. While we are proud of our past, we are focused on the future. Stay connected with BFGoodrich for consumer and commercial product updates, events and communities, as we search the globe for new challenges to conquer. Being the first tyre manufacturer to win consecutive Indianapolis 500 titles was just the beginning for this iconic performance-driven brand. The brand soon found a passion for the dirtier side of racing and built a respected off-road reputation. From the deserts of Baja to the badlands of Dakar, BFGoodrich has seen — and won — it all. It’s fitting, when you think about it, that the tyre manufacturer that created the all-terrain category in the first place is still dominating the dirt today. Since their first Baja 1000 victory in 1972, they’ve racked up well over 200 off-road championships. Including a stretch of 21 consecutive Baja 1000 titles between 1986 and 2007 — making BFGoodrich the benchmark for North America Desert racing. But like any great competitor, BFGoodrich grew restless and wanted to see what else the world had to offer. 2006 became a turning point in their global legacy, as they entered the World Rally Championship (WRC), helping Sébastien Loeb secure the title five years in a row and providing the Citroën and Ford teams wins in the constructors' championship. During their brief time in the WRC (2006-10), BFGoodrich won every drivers’ and constructors’ title up for grabs. The brand also entered the IRC in 2007, winning in its first year with Peugeot. BFGoodrich built upon this success, winning titles in the FIA Cross Country Rally World Cup and Dakar. With eight Dakar wins in the mid 2000s, BFGoodrich returned in 2016 to pick up right where they left off, by propelling Team Peugeot to victory. 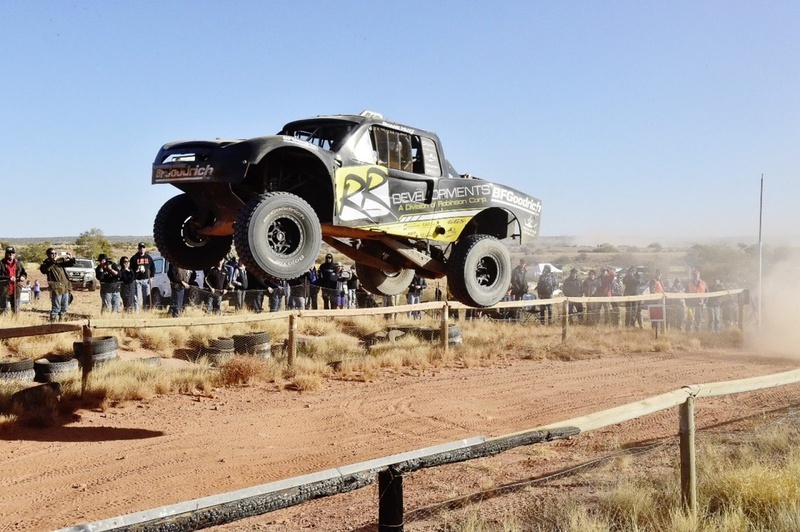 The brands presence is still felt at many local races, especially in North America where the quality of BFGoodrich tyres excels on a wide range of surfaces, including dirt, sand, rock and asphalt, proof of the incredible versatility of BFGoodrich products. OUR VALUES STAND THE TEST OF TIME. Whether driving on-road, off-road or hauling freight – we are not the kinds of drivers to just sit back and watch. We’re hands-on, take-the-wheel doers who actively seek the opportunity to prove ourselves. And we never quit until the job is done. We stand shoulder to shoulder with our customers at a multitude of events all over the world. From trade shows to small grassroots efforts — if you know a race or community that we need to be a part of, let us know. On- and off-road, we provide unmatched capability through tires designed for performance in difficult and extreme conditions. In competition and everyday life, we’ve erased all doubt about our capability on the road, off the road and over the road. Whether for performance or appearance, every design is crafted with a purpose.